Bulk SMS Software for Pocket PC allows you to send thousands of bulk SMS from your Pocket PC based mobile phones or PDA devices to multiple contact numbers. 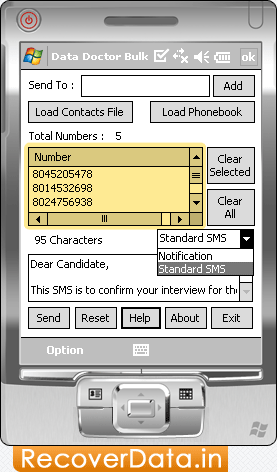 SMS Broadcasting software sends job alert notification, greetings, share market information, personalized SMS, seasonal greetings etc to individual or group of contacts in unicode languages. Software supports all major Smart phones or Pocket PC mobile phones including Asus Pocket PC Phone, HTC TyTN Pocket PC, Samsung Pocket PC phone, Carrier Devices i-Mate, HP iPAQ, i-mate, Motorola MPx200, O2 Xphone, Orange SPV E200 Smartphone, Pantech PH-S8000T smart phone, Siemens, T-Mobile MDA, UTStarcom XV6600, Anextek SP230, Voxtel W740 etc. 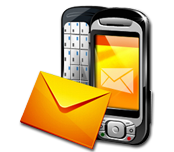 SMS Gateway software allows you to send bulk SMS from your Pocket PC or PDA to other mobile phones. Bulk SMS Utilities is useful for organizations to increase the communication level with other users. Cell Phone Texting utility does not require internet connection to send SMS at national and international level.